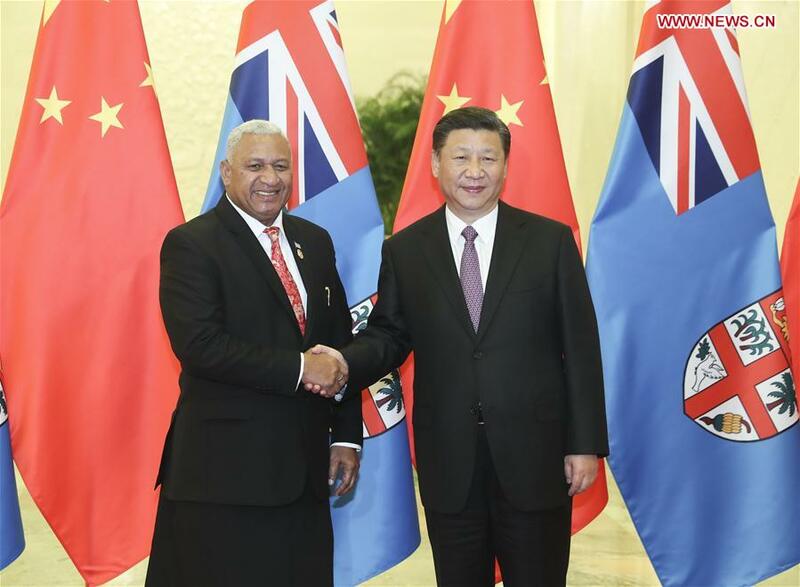 BEIJING, May 16 (Xinhua) -- Chinese President Xi Jinping said Tuesday that China is ready to enhance all-round cooperation with Fiji for the benefit of the people in both countries. China is willing to expand cooperation with Fiji on agricultural technology, green development, investment and trade, Xi said during a meeting with Fijian Prime Minister Josaia Voreqe Bainimarama, who attended the Belt and Road Forum for International Cooperation held in Beijing from May 14 to 15. China and the Pacific island country forged a strategic partnership based on mutual respect and common development in 2014, lifting bilateral relations to a new height. Xi noted that the two countries are enjoying deeper political mutual trust, stronger pragmatic cooperation and closer people-to-people exchanges, while calling for continued mutual support on issues concerning each other's core interests and major concerns. China will encourage more tourists to visit Fiji, and support Chinese enterprises to expand business in the country, he told Bainimarama. Xi expected closer communication and cooperation with Fiji in such areas as education and culture, as well as more local-level exchanges and cooperation. He expressed China's willingness to boost coordination and cooperation with Fiji under the United Nations framework, and maintain communication and coordination on major issues such as climate change. Voicing support for the Belt and Road Initiative, Bainimarama said Fiji is willing to boost cooperation with China under the initiative. Bainimarama said Fiji will stick to the one-China policy. Fiji will deepen cooperation with China in areas including agriculture, infrastructure, trade and people-to-people exchanges, while furthering coordination on climate change and sustainable development, Bainimarama said. While meeting Bainimarama, Chinese Premier Li Keqiang said the two countries should align their development strategies, expand cooperation, and push forward common development. Li said China has always been a responsible player in the global fight against climate change and actively implementing the Paris Agreement on Climate Change, in an effort not only to fulfill the country's obligations, but also to restructure its economy. Li expressed China's willingness to support Fiji's presidency of the 23rd session of the Conference of the Parties (COP23) to the United Nations Framework Convention on Climate Change. Bainimarama welcomed China's long-term support for Fiji and expected greater industrial and trade cooperation between the two countries.